If Chino Hills isn’t really on your radar, that’s OK. The affluent, rural-ish suburb on the southwestern tip of San Bernardino County mostly yields Google results for high school basketball prodigies the Ball brothers. Anyone who has passed through Chino Hills on the 71, though, has likely caught a glimpse of the city’s most impressive landmark—a towering Hindu temple. 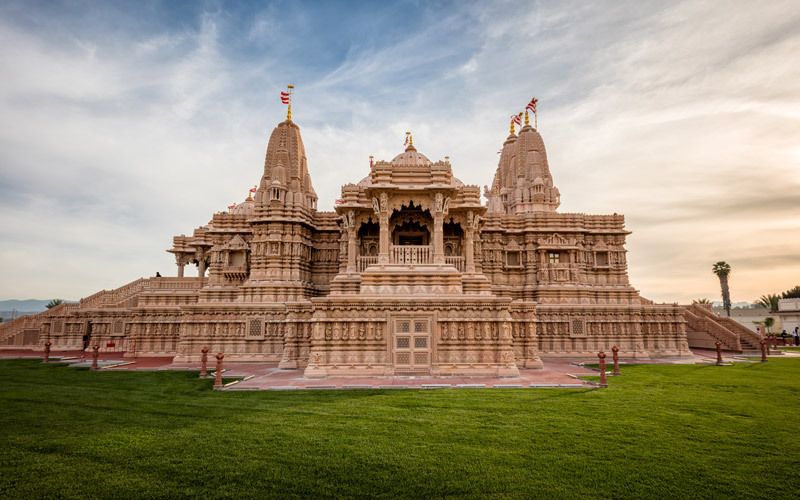 Completed in 2012, the BAPS Shri Swaminarayan Mandir is the fifth such traditional Hindu temple in North America, and it is a wonder to behold. Every piece of stone used to construct this monument was hand-carved in India and shipped to the U.S. for assembly. The pink Indian sandstone exterior is detailed with relief carvings of Ganesha and myriad other deities. Shrines within house a variety of murtis—images and statues of a deity or guru—like Bhagwan Swaminarayan and Aksharbrahman Gunatitanand Swami, below. Out front of the temple, a lotus-shaped reflection pool burbles with fountains, and nearby, the Haveli (visitor center) is a trove of polished wood carved with flowers, horses, elephants, peacocks, and human figures. Possibly best of all, the mandir’s Shayona cafe serves bomb Indian vegetarian food. They’ve got crispy samosas, chole bhatura, and some solid pani puri—and you can’t go wrong with a bottle of their mango or pistachio lassi, a sweet yogurt drink. Next door there’s a snack shop where you can get packaged anjeer bahar (chewy fig sweets) and soft, saffron-flavored kesar penda desserts for later. Previous articleMegan Mullally is Playing Largo, and We Talked to Her About It Because How Could We Not?